The bright lights and excitement of Las Vegas are part of what make it the enticing oasis in the desert that it is. But sometimes getting back to nature can provide the break from the pandemonium that we need. Luckily, Las Vegas is surrounded by some of the most scenic landscapes in the country. From picturesque parks to clear blue lakes to mountain view hikes, exploring the outdoors desert style never ceases to impress. 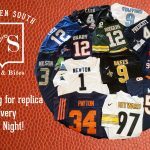 NFL replica jersey giveaway begins this Monday night at 17˚ South Booze & Bites!